I presented on the healing power of expressing emotions tonight through my Rec Therapy CEUs webinar program. The average length of a person who attended webinar was 63 minutes – which is good knowledge because ethically, I can only award one clock hour for 60 minutes. The full session was 75 minutes. 288 people clicked on the registration link. 202 out of the 288 people actually registered for this session. That was about a 70% rate. Of those 202 – about half (50%) 103 people actually attended. Of course many of those who didn’t attend will get access to the limited time replay over the next few days. · The truth in it, I love journalism. I appreciated the adaptive techniques mentioned. · I liked the activity suggestions, book recommendations, memoir excerpts, and the interactive aspect of the webinar. · I really enjoyed the different ways to complete the journaling process. I also liked the interaction that we have with the one exercise to see how it works. · Ways to adapt journaling. · The information provided was very useful! · Very interactive and required you to focus on the presentation. Good list of book recommendations. Great topic I’d like to dive into more. · the examples are great and you explained how i can improve my journaling program where i work. · Lots of great info. Thanks, Danny! · It was the first time I’ve learned more in-depth information about journaling. · This webinar was very eye opening and gave me some great ideas to use with my residents. Thank you! · I enjoyed the different activity ideas you gave as suggestions for groups. · The wealth of knowledge that Danny has! · Yes, i like the stories and activities. · I enjoyed hearing about the books you used for examples. I enjoy reading and have read Go Ask Alice before. · I enjoyed the activities a lot and learning how journaling can be used as a therapeutic tool. · The layout and engagement with the activities. · Thought it was thinking out side of the box. · Very upbeat and great to listen to. · I learned a lot of good tips and ideas and especially like to hear personal stories of different people who were successful with expressing their emotions as a way to work through their trauma. · Learning how journaling could be incorporated into a therapy program for those who may not want to journal. the use of questions through the activities was very inspiring. · I enjoyed the interaction. I cant think of any. I thought it was done well. It seemed a little rushed, and focused mostly on journaling–and although journaling is a great way to express oneself, I wish the webinar also covered other modes of expressing emotions, such as art, music, dance, etc. A lot of the books you talked about were great and they were books that i completely forgot about but just reminded me how great they are and how empowering they can be in recreation therapy. I enjoyed the webinar and do not have any feedback for improvements. I think the reflection during the activity could have been more “real”, it felt rushed and as a result as “fake”. It would be more effective for learning to instruct others to spend more time experiencing. Great job, Danny! Looking forward to the next course. Leave a little more time to go over the activities, and to have more time to go into further discussion about the benefits of the activities. Is there anyway to see the rest of the attendees comments in the “question” box? I think that would be beneficial. More examples of activities you could do, but loved the examples you provided. It was all lovely, very informative and fun!! I thought it was great. Thank you for keeping it fresh. I thought this was well laid out and presented. It was very informative. Maybe more examples that you or others have used that are creative expressions of our clients. When presenting a question if would be helpful to keep it up throughout segment. Thank you! 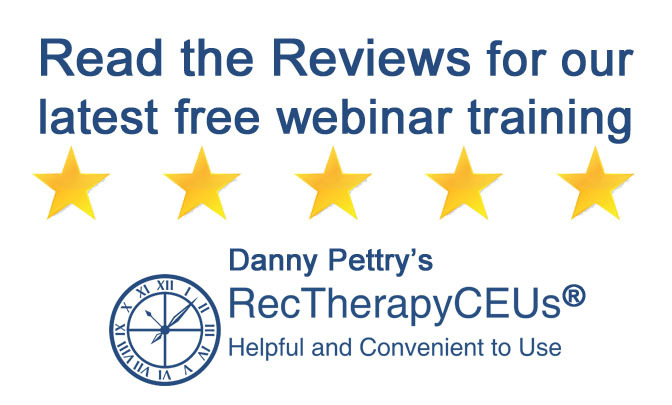 Do you want to teach a course at RecTherapyCEUs and earn royalty? We’re looking for amazing people just like you!